A few months ago, users have taken a greater awareness as far as communications security and privacy concerns. After the scandals of telephone and espionage tracks have proliferated a number of services and applications that allow people to communicate with desire safely. 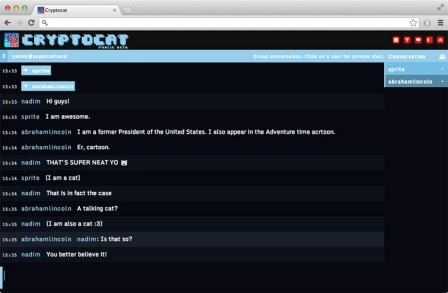 One of the latest has been Cryptocat, a popular application that has been rejected by Apple in its iPhone version for illegitimate reasons according to its creator. The encrypted chat service Cryptocat has spent the last two years struggling to prevent unwanted users from accessing our private conversations with their applications for different operating systems or extensions to browsers. However, after all this time, now faces an enemy they did not expect: Apple and certification to launch its service in the App Store. According to its developer, Nadim Kobeissi, Cryptocat has been unfairly rejected by the company. Not to go into details, but says that the reasons given for non-Apple software release were illegitimate and could threaten similar applications. “One of the reasons for rejection of Cryptocat iPhone by Apple strongly implies that any other group of encrypted chat applications can be rejected,” said in a tweet. Cryptocat has worked all these months to offer their service to both ends could communicate safely and easily thanks to the encryption of data. The service exceeded international boundaries and gained some notoriety thanks to recent cases of government espionage and countries where freedom of expression is limited. This has caused some problems Kobeissi have had to travel by plane, it would normally spend extra security checks mandatory and also in protecting their infrastructure. Specifically, for fear that the Canadian government entrometiese, the entire network of Cryptocat moved to a Swedish nuclear bunker. One of the curiosities that let this rejection is that Apple Cryptocat is now available on the App Store for OS X , which has some similar to the requirements of mobile devices. These guidelines must be met by developers to publish an application, unlike other operating systems, Apple does not allow the installation of applications outside of this store. Latest reports indicate that Apple has not yet responded to comments on the rejection and Kobeissi has threatened to take up the matter legally.